When you choose a long-haired cat as a pet, you assume certain grooming responsibilities. 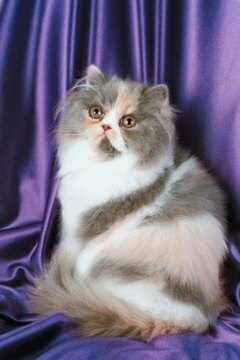 Your long-haired cat’s fur will require frequent brushing and combing to reduce matting. However, many cats do not enjoy being groomed, so chances are that you may postpone unpleasant grooming sessions, only to have to deal with matted fur later down the road. Work on a calm cat. Do not interrupt your pet while he or she is sleeping, eating or playing or is in an excitable state. Cats generally dislike grooming, so there's no need to make the experience any more unpleasant by choosing an inappropriate time to do the de-matting. Check the size of your cat's hair mat. If it's bigger than your thumb, do not try to remove it yourself. Instead, take your cat to a professional groomer. Brush all the hair around the mat to make sure there are no tangles. Break up the hair in the mat using a mat rake, which is a grooming tool that can slowly and gently break down the mat. Start with the top layer of the mat. If it's particularly thick and stubborn, break down one layer at a time. This will make it easier for you and less uncomfortable for your cat. Remove hair as it falls out and carefully keep working until you have broken apart the mat. Avoid cutting a mat with scissors. If it seems as though clipping is the only way to remove the mat, take your cat to a professional groomer. Accidentally nicking your cat's skin is easier to do than you might think, especially if your pet is squirming while you're working. Never tug on a mat to try to remove it. This rarely works. Additionally, it's very painful to your cat and can cause skin irritation or infection. How Do Bunnies Keep Their Nails Short in the Wild? If You Give a Rabbit a Bath Will It Hurt It?